The unassigned bin is wonderful to have when you need something quickly. This has been waiting there for quite awhile. 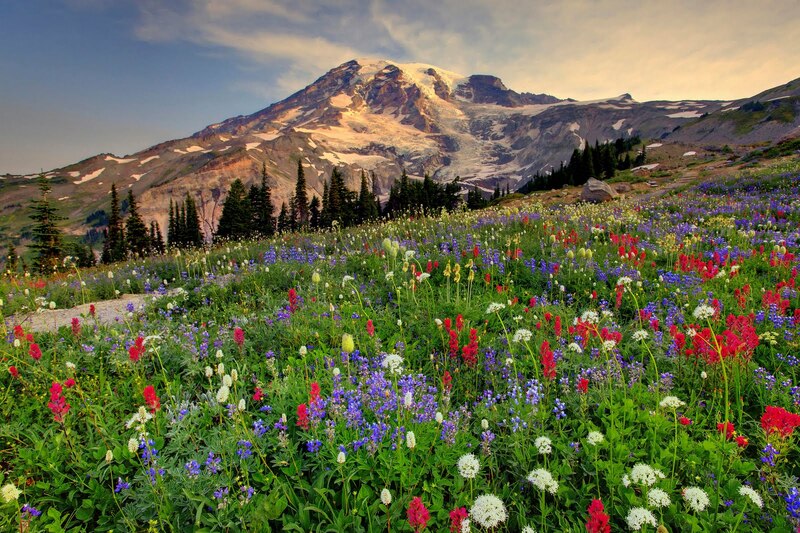 Snow does not melt from Mount Rainier till mid-July and August. At that time wildflowers burst out onto the meadows for their very short season. It begins to snow again in September. This shot was taken in mid June. No dust...no mould...it hasn't been there very long, Mary. It must be such a joy to see these ephemeral wildflowers, Mary - and what a backdrop! A delightful view of the landscape, way too good for the unassigned bin! Very fine Mary, peaks of mountain and peaks of tree. Thanks for digging it out of the bin Mary, a really enjoyable picture. Is that Mt. Rainier in Washington? if so, I've been as close to it as I can get by car; a place called Sunshine. Those wildflowers are wonderful. Beautiful shot, Mary! I love great mountain shots!! !